Crescent Rolls + Hot Dogs + Crescent Dogs. Photo and recipe courtesy Pillsbury. You don’t need a grill to cook memorable Labor Day fare. 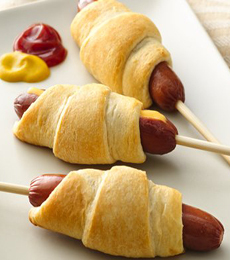 Make that classic fun food, Crescent Dog on a Stick, in your oven. A hot dog wrapped in a cheese and a Pillsbury Crescent roll, the stick is actually optional (as is the cheese). You can layer other flavor bursts inside the crescent, such as pickle relish or chopped jalapeños. The recipe is easy and the experience will be remembered happily for a long time. Prep time is 10 minutes, total time is 25 minutes. 1. PREHEAT oven to 375°F. Slit hot dogs to within 1/2 inch of ends; insert 3 strips of cheese into each slit. 2. SEPARATE the dough into triangles. Wrap a dough triangle around each hot dog. Place on an ungreased cookie sheet, cheese side up. 3. BAKE at 375°F for 12 to 15 minutes or until golden brown. Insert 1 stick in each crescent dog and serve.